We chose this cruise because it has been our dream to visit Alaska for some time. The departure city of Vancouver BC was an additional reason that locked in this wonderful vacation of our lifetime. We reserved over a year ahead of cruise. We flew into Vancouver two days early and explored Victoria and (Buchart Gardens) day 1 and Vancouver day 2. The trip to the Buchart Gardens and Victoria was wonderful. They are both beautiful to experience and we enjoyed them very much. The exploration of Vancouver parks and different sections of town was great and we ended in Gastown section where spent extra time touring and eating across street from the steam clock at Water Street Cafe. The embarkation process went smoothly at Canada Place. We found the Jewell very clean and everyone on the crew extremely knowledgeable and helpful. Our stateroom was clean and comfortable and kept that way by our very good steward. We primarily used the Garden Room buffet for breakfast. Food was very good with a good variety. We experienced a delay in finding seats a couple of days but otherwise it was very good. We ate two meals on most days having dinner at Tsars and Azura most of those evenings. Very good food selection and wait service. Very attentive to our requests, expedient and friendly. They were always seemed happy to be serving us. Every show we went to had very professional entertainment. Whether the evening variety show or lounge shows we enjoyed them especially Fire and Ice duo Michael Jackson presentation was exceptional. We didn&apos;t partake of many other activities as cool and damp weather made using the pool hard for us. We liked Deal and no deal. We did&apos;t travel with children but the Jewell had many activities and programs especially for them along with a presentation out on by kids late in the cruise. We experienced shore excursions in Ketchikan, Juneau and Skagway. We went kayaking at a secluded lake with salmon cookouts. Visited Mendenhall Glacier a Salmon hatchery and unique Glacial Gardens tour and went on a Yukon motor coach tour. We enjoyed all of our excursions. Only regret is not scheduling a whale excursion. We did see some whales on board ship but at a distance. We saw many other animals including bald eagles, moose, caribou and bears on the trip. Disembarkation was very smooth and organized on a very rainy day. We exited to our motor coach for the land portion of trip to Anchorage and Denali. Our exceptional tour guide Paul Long was excellent and kept everything going smoothly enough that we were able to make a couple extra stops at Exit Glacier and Alaska Veterans War Memorial on the trip. Can&apos;t say enough about how great Tall Paul was on this trip. Very accountable for everyone&apos;s experience and took care of everyone individual needs. He is a special person. We experienced a delay on out Alaskan railroad ride from Denali to Talkeetna and Paul made sure that the railroad handled it promptly and with class. We will do this 11 day Denali Cruise trip again. We do recommend it to everyone. We had an amazing time. Everyday we had something new and special to look forward to and experience. Very exciting 11 days for us! Glacier Garden in Juneau. Up side down tree garden. Denali peaks over the clouds. Only 30% get to see mountain. Mendenhall Glacier out of Ketchikan. Great visitor center and trails. We chose this cruise because it has been our dream to visit Alaska for some time. The departure city of Vancouver BC was an additional reason that locked in this wonderful vacation of our lifetime. We reserved over a year ahead of cruise. We flew into Vancouver two days early and explored Victoria and (Buchart Gardens) day 1 and Vancouver day 2. The trip to the Buchart Gardens and Victoria was wonderful. They are both beautiful to experience and we enjoyed them very much. The exploration of Vancouver parks and different sections of town was great and we ended in Gastown section where spent extra time touring and eating across street from the steam clock at Water Street Cafe. The embarkation process went smoothly at Canada Place. We found the Jewell very clean and everyone on the crew extremely knowledgeable and helpful. Our stateroom was clean and comfortable and kept that way by our very good steward. We primarily used the Garden Room buffet for breakfast. Food was very good with a good variety. We experienced a delay in finding seats a couple of days but otherwise it was very good. We ate two meals on most days having dinner at Tsars and Azura most of those evenings. Very good food selection and wait service. Very attentive to our requests, expedient and friendly. They were always seemed happy to be serving us. Every show we went to had very professional entertainment. Whether the evening variety show or lounge shows we enjoyed them especially Fire and Ice duo Michael Jackson presentation was exceptional. We didn&apos;t partake of many other activities as cool and damp weather made using the pool hard for us. We liked Deal and no deal. We did&apos;t travel with children but the Jewell had many activities and programs especially for them along with a presentation out on by kids late in the cruise. We experienced shore excursions in Ketchikan, Juneau and Skagway. We went kayaking at a secluded lake with salmon cookouts. 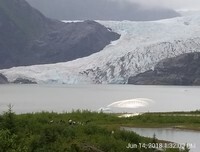 Visited Mendenhall Glacier a Salmon hatchery and unique Glacial Gardens tour and went on a Yukon motor coach tour. We enjoyed all of our excursions. Only regret is not scheduling a whale excursion. We did see some whales on board ship but at a distance. We saw many other animals including bald eagles, moose, caribou and bears on the trip. Disembarkation was very smooth and organized on a very rainy day. We exited to our motor coach for the land portion of trip to Anchorage and Denali. Our exceptional tour guide Paul Long was excellent and kept everything going smoothly enough that we were able to make a couple extra stops at Exit Glacier and Alaska Veterans War Memorial on the trip. Can&apos;t say enough about how great Tall Paul was on this trip. Very accountable for everyone&apos;s experience and took care of everyone individual needs. He is a special person. We experienced a delay on out Alaskan railroad ride from Denali to Talkeetna and Paul made sure that the railroad handled it promptly and with class. We will do this 11 day Denali Cruise trip again. We do recommend it to everyone. We had an amazing time. Everyday we had something new and special to look forward to and experience. Very exciting 11 days for us! Cabin was maintained well and kept very clean and organized. The bathrooms were a little small but this is normal for a cruise. This didn&apos;t really bother us. Sheets were turned down with a little origami animal every evening. The room had a good ocean view which we enjoyed. We didn&apos;t spend much time in room since there was so many other activities to do. Toured to Mendenhall Glacier via motor coach and also stopped at hatchery and Glacier Gardens on the way. Rained off and on but didn&apos;t notice as we were able to avoid most of it. Dropped off in Juneau for walk around and stopped at Red Dog Cafe..
Kayak on a secluded island in a 20 person kayak and had a salmon cookout. Had a great time even though it was raining. Went on day trip to Victoria and Buchart Gardens. This was a motor coach and ferry tour that lasted 13 hours but was well worth the trip. 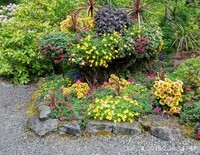 Victoria is a wonderful city that we enjoyed walking around and you can&apos;t say enough about Buchart Gardens. Very beautiful. Half day tour of Vancouver parks and city areas. Included visit to Granville and Stanley Park and went through Chinatown, Gastown and several others. We ended trip in Gastown and had dinner at Water Street Cafe across from steam clock.